The electric dipole contains positive and negative charges of equal magnitude. Therefore the total charge inside the cubical surface is zero. By Gauss’s law the total electric flux through the cubical surface is zero [Option (a)]. 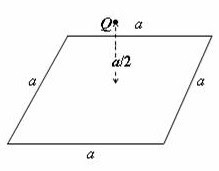 The area vector by convention is perpendicular to the plane of the area. Since the area vector is directed along the x-axis, you know that the square lies in the yz plane. Therefore, there is no electric flux passing through the square and the correct option is (e). [In vector notation electric flux is the scalar product (dot product) of E and A. Therefore we have flux Ф = E.A = 200 ĵ . 0.04 î = 0]. 0 = q/ε0 where q is the total charge inside the closed surface. The total electric flux lines originating from the positive charge Q is Q/ε0. Since these flux lines are distributed equally among the six faces (or three pairs of faces) of the cub e, the flux through one pair of opposite faces of the cube is Q/3ε0. (5) A hemispherical bowl of radius R is kept inverted on a horizontal table (so that the mouth of the bowl is in contact with the surface of the table). Assume that the surface of the table coincides with the XZ plane of a right handed Cartesian coordinate system. 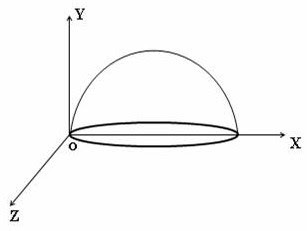 If a uniform electric field E directed along the negative z-direction exists in the entire region, what is the electric flux through the mouth of the hemispherical bowl? As the mouth of the bowl is lying in the XZ plane the electric field E (which is along the negative z-direction) is parallel to the plane of the mouth. The electric flux through the mouth of the bowl is therefore zero. You may imagine the charge Q to be at the centre of a cube of side a. 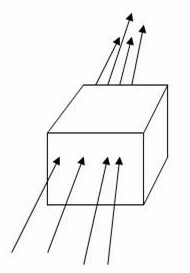 The total flux through all the six faces of the cube is Q/ε0 by Gauss’s law. Now think of the square given in the question. Since it makes one face of the cube, the flux through it will be one sixth of the total flux. So the correct option is Q/6ε0. Now, see some useful multiple choice questions (with solution) in this section here.